It’s here, Apple’s iPhone 5, or rather the iPhone 4S–ending a ton of speculation about its name, and spurring hundreds of “what, no iPhone 5?” comments from webizens who’d been hoping for that exciting-sounding re-design to surface. The thing is, though, the iPhone for 2011 is very similar in external design to the iPhone for 2010, but its real selling power is what’s inside. Apple honed, polished, boosted, adjusted, extended, and pushed the capabilities of the iPhone 4S to the max. There’s a good reason Apple kept the iPhone 4’s chassis design the same: It works. Apple’s been making these things (or at least its Eastern suppliers have) by the tens of million for well over a year now, and the process will have been optimized to the point that the cost of building them is tailing off fast–boosting profits. The decision also makes for improved reliability, allowing Apple to dodge any re-run of “antennagate” (which was, in any case, somewhat overblown) and learn the lessons about making the radio system of the iPhone 4S “just work.” In fact, Apple made a point of mentioning the antenna in the presentation, saying it now does intelligent antenna switching to maximize the way it handles incoming and outgoing signals. Plus, there’s all the peripherals out there that third-party firms sell, which will now remain compatible. Then there’s the fact that by combining the experience from the iPhone 4 and the CDMA edition, Apple’s now made the 4S a world phone, with both CDMA and GSM capabilities–requiring some clever antenna action as well as some tweaked internals. As well as ensuring good performance, from a year of field experience, this means Apple can control production costs downwards, since they’re only making one device. Apple even said the radio systems of the new phone can cope with 14 Mbps download data rates, meaning that it’s almost approaching some 4G speeds–even though it’s definitely a 3G-tech device. 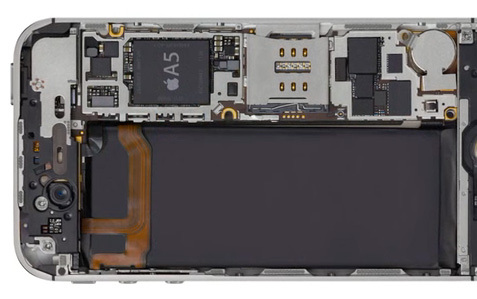 So what Apple’s done, primarily, is to make over the inside of the iPhone. The new 4S has an A5 processor, as expected, bringing the same dual-core processing power the iPad 2 sports to the iPhone. Alongside that comes a better graphics processing unit, which Apple says provides “up to 7x faster graphics”–a fact they used to demonstrate the game Infinity Blade 2, an almost game-console quality advancement on one of the games they used to promote the iPhone 4. The camera inside the 4S was also given some attention by Apple, and whoever chose the hardware has proved they really understand what the photography game is all about–it’s not the megapixels. Phil Schiller even said the pixel count was just a part of the game, and the optics and other aspects of the camera–like Apple’s choice of a back-illuminating sensor, with a design that means 75% boost in light performance–matter most. The tiny lens on the unit now has five optical elements, welded together to optimize performance so that Apple says it has “30% more sharpness” over the iPhone 4, with an improved IR filter for better color reproduction. The physical changes mean the iPhone 4S’s camera can handle low-light situations much better than its predecessor (including incorporating a dynamic noise suppression system). Apple’s also tweaked the hardware-software interface for the device, meaning image captures take 33% less time, and takes just 1.1 seconds after activating the camera app to allow you to take a photo. Compared it to its peers, the Samsung Galaxy S2 takes 2.0 seconds, and the Droid Bionic a huge 3.7, Apple reported. The iPhone 4S also has improved image data transport and processing time, so it takes just 0.5 seconds to take the next image, compared to the S2’s 1.3 seconds, and the Bionic’s 1.6 seconds. Add in 1080p video capture, image stabilization in video-mode, face recognition–a whole kettle-full of excitement all by itself–and the camera really threatens your traditional point-and-shoot cameras. The process to tweet out new images is just a single tap at the screen, and with iCloud the photos are automatically shared to a backup, features most cameras can’t match. Though Apple didn’t mention the reasons for the current limitations of Siri, they’re likely due to the upgraded internals of the 4S over earlier iPhones, particulary the RAM available for the A5 chip. Siri’s voice processing happens in the phone, unlike Google’s equivalent services, which send samples of sound off to the cloud for processing…something that takes time, requires a good 3G connection and which will hit users on limited data tarrifs. It’s hard to overstate exactly how transformational Siri is to the smartphone experience, and it’s possible it may become one of the biggest draws to the new iPhone 4S. 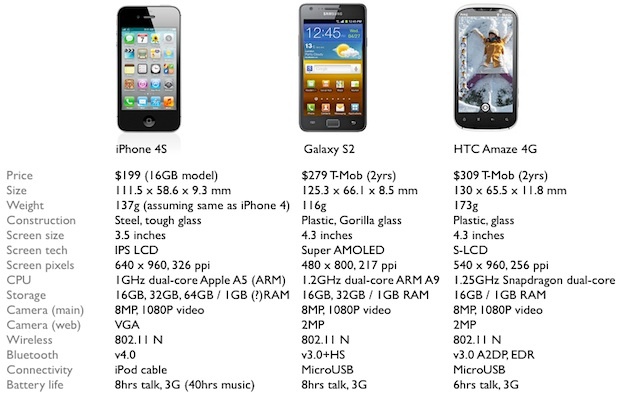 As for the iPhone 4S’s peer devices, check out our comparison chart below–the Galaxy S2 and HTC Amaze are likely to be its biggest high-profile competitors for the key holiday season sales. While iOS 5 and software bonuses like Siri are impressive, the hardware-software synergy of the iPhone 4S is what Apple’s been working on the most. The new tapered chassis that was the subject of so many rumors is probably still on tap, but by polishing the design and keeping the price point controlled, it’s managed to keep the iPhone at the top of the smartphone market.